Taking the CUNY Assessment? We can Help! Test strategies, exam information, practice questions, how to take a test, how to study and more! Need Help Studying for the CUNY Proficiency Exam? The City University of New York has its own entrance exam, called the Skills Assessment Program. The CUNY is an aptitude test which evaluates your ability to learn, rather than what you have already learned like most tests. The exam is divided into 3 components: writing, reading and math. The reading component tests for reading comprehension, and your ability to analyze written information. The math component covers basic math, algebra (including college level) and trigonometry. The written component is an essay question where your vocabulary, spelling, argumentation skills and ability to organize your thoughts on paper are tested. Use mnemonics to remember complex groups of things. This exam primarily tests your aptitude and not your ability to memorize. Complete Test strategy for the CUNY Assessment Test! 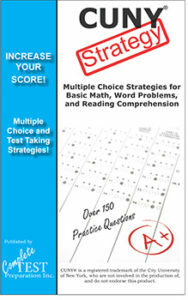 Learn and practice powerful multiple choice strategies for reading comprehension, basic math and word problems! Very helpful to me. I pass the cuny placement test with higher markds.